This little girl loves the tub! Holly's favorite time of the day is bath time. 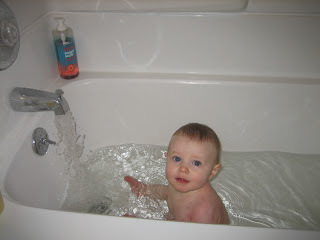 She loves sitting in the tub when it is filling up, letting her fingers and toes run through the water. She loves splashing around and getting water everywhere. She loves playing with her toys and washcloth. In fact, the only thing she doesn't like about the tub is: getting clean! Oh, well. She is just like her mama in this way. My idea of a perfect evening is a nice, long, hot bubble bath, followed by reading in my warm, cozy bed, all wrapped up in my Snuggie. Ah!